Aspheric lenses are a cost effective way of reducing the number of optical elements in a system. A correctly formed aspheric lens surface may cancel or control spherical aberration. As a result more energy can be concentrated into a smaller area. Aspheric lenses are best suited for low f-number, high throughput applications. 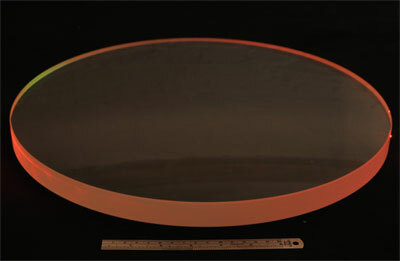 Optical Surfaces has made a speciality of producing high quality aspheric lenses for many end users particularly in the high-energy laser research field. Optical Surfaces made a significant contribution to the high energy density physics program called Orion. Very high quality Lenses from 50mm to the 370mm focusing elements were supplied and have been integrated into the very high power laser beam lines. Orion has two sets of beam lines; 10 long-pulse beams each providing up to 500 J of ultraviolet light and two short-pulse chirped-pulse amplified beams. When focused these beams produce a power density of 1021W/cm2 on target. By way of comparison the power density delivered by the sun to the Sahara desert is 0.1 W/cm. Orion is designed to support a wide field of scientific exploration including particle acceleration, X-ray laser research and the production of short-lived isotopes.